Class reunions take a lot of planning and it requires some very special volunteers to pull it off. This is part 2 of an article that goes over what to discuss during the initial planning meetings. This is part 2 of an article on what to discuss during your class reunion planning meetings. Click here to read Part 1. Before the hotel selection committee can get Group Hotel Rates or the catering committee can get prices, you will need to estimate the number of classmates who will attend. Expected attendees will influence the venue chosen, hotel selected, memory books ordered, and a host of other things. There are two ways to estimate attendees. If you have had previous class reunions, then use the final attendance numbers from there. Or you can get historical attendance numbers from the schools Alumni office. 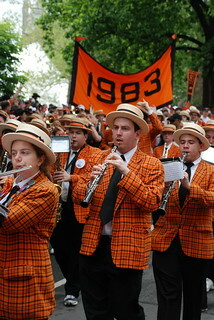 The average attendance at most class reunions is between 20-30% of the graduating class. Bring up the topic of presenting a class gift to the school in honor of the class reunion. The gift can be for a something specific (e.x. A new computer lab) or it can be given to the school’s general fund. Fundraising for a class gift should start early in the reunion planning. The most successful class gifts are ones where a clear monetary goal is announced and a worthy cause is selected. One person should be wholly responsible for the creation of the Class Reunion Memory Books. Their responsibilities should be to create/send a class reunion questionnaire, hire a photographer, and organize the memory book layouts. Class favors are what you give out at the big Saturday banquet to everyone attending. It’s usually something small with the class or school logo and the year of the reunion. There are many expenses that the reunion planning committee will incur along the way. Gas, tolls, office supplies, hosting fees for class reunion website, etc. are all necessities that will need to be accounted for. Will the class reunion planning committee pay for these? If not all of them, then will they pay for some of them? When will the reimbursement occur? Where do you submit reimbursement forms? These are questions you will be asked so make sure to have answers ready. As a rule of thumb, you should agree to pay all reasonable expenses incurred in planning a class reunion. By refusing to pay for expenses incurred, you are creating a resentment right from the start. Plan to meet monthly with your classmates to catch up what was done and what tasks were still outstanding. Set the dates (“Meet on the first Sunday of every month for breakfast”) right from the beginning so people can set their schedules accordingly. What To Do Till The Next Meeting? Just like you can’t plan a class reunion all by yourself, the committee members cannot accomplish their goals alone. Encourage everyone to recruit volunteers to help out with tasks. Post “Volunteers needed” pleas on the class reunion website, and send out emails to classmates asking for their help with small tasks that can be done in a few hours. An added benefit of attracting a lot of volunteers is that it engages more people and gets them involved in the planning process. This creates a buy in factor that results in increased attendance at the class reunion. The purpose of the first few meetings is to go over (in broad terms) responsibilities and expectations from the committee members. While the tasks mentioned above may be too detailed for smaller class reunions, they provide a great beginning to medium and large sized ones. Happy class reunion planning. Since you’re planning a class reunion, why not read about how to create and maintain a class reunion budget. Download our free class reunion planning guide and learn how to save thousands. Get it now. "I have been planning our family reunions for over 20 years and one of the most frustrating parts was having to contact hotels in different cities. I had to put aside several days just to get the "hotel project" done. The problem has always been that hotels don't always in a timely manner. Many would just take my request for rooms, and then I would hear nothing. Absolute silence. Once i found your site, it was like a dream come true.I had group rates for hotels the same day that i put in the request on your website. It was incredible. I will never go back to calling hotels myself.